Spaghetti Aglio e Olio (e peperoncino!) is simple, healthy and sure to tickle your tastebuds. Join me along with one of my young superstar fans, Dorian as we create this astonishing dish in a beautiful Sydney park . 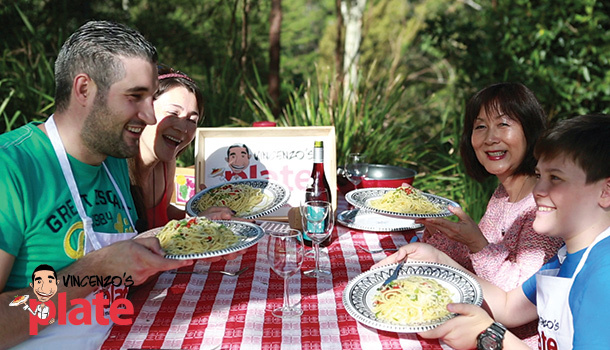 Dorian's enthusiasm and love for food will be sure to make you rush to the kitchen and with just a few special ingredients, Spaghetti aglio e olio will become your go-to for a quick, irresistible meal. 2. Finely slice 2 cloves of garlic and chop them into small pieces. 3. Slice up both chillies and then cut these up into small pieces too. 4. Chop a generous amount of parsley. 5. 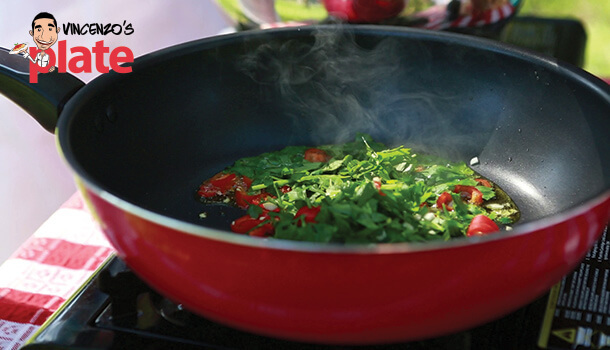 To prepare your Spaghetti Aglio e Olio , put a large, deep fry pan on low heat and drizzle some evoo over the top. After it heats up (around a minute or so), add the chopped chilli, garlic and parsley. 6. Add some cracked pepper over the top and mix well using a wooden spoon. 7. Leave this to cook for around 5 minutes and remember to stir it every now and then. 8. Once the water has boiled, throw in some rock salt and mix it through. Now, add the pasta and cook it to the instructions on the packet (this is best served al dente). Vincenzo's Plate Tip: If the ingredients aren't smothered with evoo, there probably isn't enough! Add some extra oil as it is the key ingredient so that the pasta will be well lathered once it is mixed together. 9. Keep an eye on the pan and make sure the garlic doesn't burn as this will ruin the taste! If it starts to brown, add a small drop or two of water but be careful! 10. Once the pasta has finished cooking, strain it and add it to the fry pan - adding a little boiled water as you go. 11. Mix this together really well using a set of tongs and then swirl and toss the pasta around so that all of the ingredients which are at the bottom, come to the top and beautifully colour the strands of spaghetti. 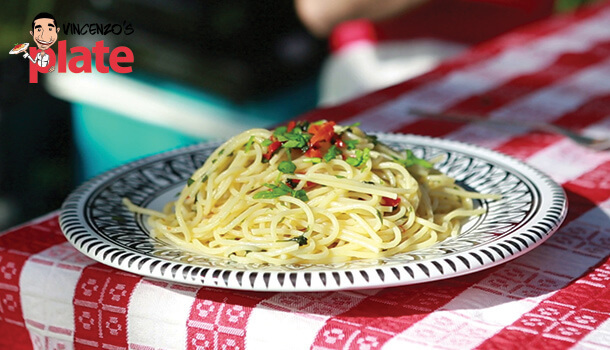 Vincenzo's Plate Tip: Spaghetti Aglio e olio should be cooked then eaten right away as it is best enjoyed hot from the pan! How to Serve: Add it to your desired serving plate and then grate a generous serve of parmesan cheese over the top along with an added drizzle of evoo to tantalise your tastebuds!